The Kailash Sacred Landscape (KSL) Conservation and Development Initiative was conceptualised through an iterated consultative process between the governments and partner institutions in China, India and Nepal, and ICIMOD. Implementation of this unique programme commenced in 2012. KSL is spread across a vast region including remote portions of the Tibet Autonomous Region of China and contiguous areas of India and Nepal. This trans-boundary landscape is woven together by several ecological, historical and cultural linkages. It is the source of four of Asia’s most important rivers - namely the Indus, Brahmaputra, Sutlej and Karnali - and home to a great ecological diversity. But the iconic feature of KSL is the sacred Mt Kailash and the Manasarovar lake. Mt Kailash has traditionally been viewed with religious awe and great reverence by followers of Bon religion, Buddhism, Hinduism, and Jainism. Some traditions worship this strikingly symmetrical mountain as the centre of the world, while to others it has been the abode of gods and the site of great spiritual events. 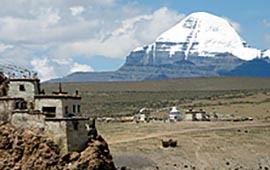 Due to the positional significance of Mt Kailash in the cosmologies and mythologies of these major religious traditions, the region surrounding the sacred mountain shows a unique concentration of sacred sites of various kinds; diverse local belief systems and numerous pilgrimage routes. Besides, the region designated as KSL is crisscrossed by ancient salt-grain trade routes that have survived almost intact until recently, engendering a local trading economy and flourishing culture. However, political changes in the region since the mid-twentieth century and the influx of salt from India have brought this cross-border trade to an almost complete halt. These traditional routes and other remnants from the past add to the beauty and rich cultural history of KSL. Not surprisingly, this region has also become very popular in the recent decades among tourists due to its unique aesthetic, cultural and adventure dimensions, besides continuing to draw ever larger numbers of pilgrims (whom one may also call ‘religious tourists’) every year. However, the inadequacy of proper infrastructure development and lack of integrated landscape management strategies are adversely impacting the cultural integrity and environment of the region. To adequately balance the needs of conservation and development, innovative research and collaborative management strategies need to be developed at the transboundary scale - that ICIMOD has been striving to achieve.